For every Exped product there is a battery of tests performed. Some at the factory, some in the field, and some in the design room. 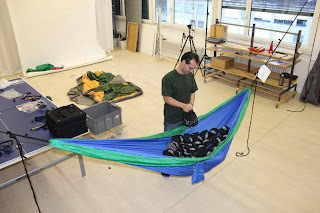 Recently, the new (March 2013) Exped Travel Hammock, Drip Clips, and Suspension Kit were run through their paces. 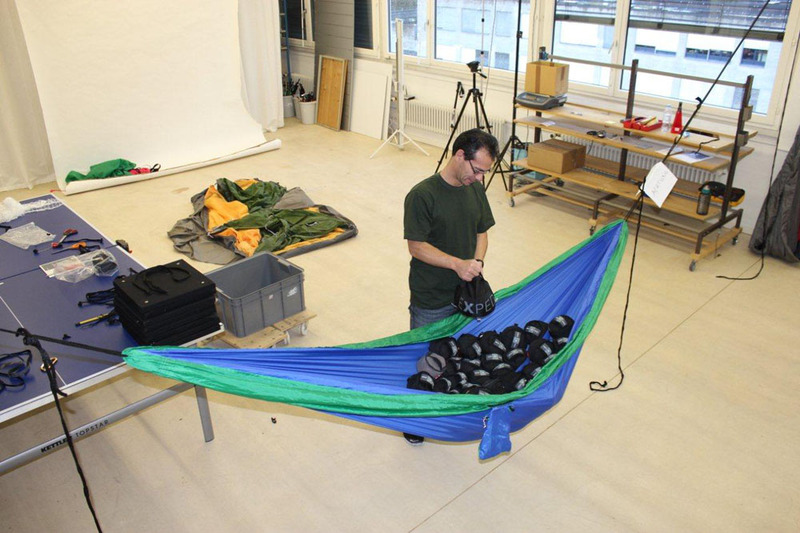 In the photo, weights are being loaded into the hammock to test the strength of all components together, as they are used in the field. Two tests are run. The first is a simple load-to-failure test: add weight until something fails. The other is a "long term" test in which 302 kg/665 lbs is held by the hammock for 12 hours. All components survived the 12 hour test with flying colors. Now, these are extreme tests - the actual recommended load capacity for the Exped Travel Hammocks (and accessory components) is 150kg/330 lbs.